Wendy BuiterWendy Buiter describes her work as an extension of herself: playful, bold, vibrant and feminine, with a touch of luxury. A piece of her own story, a portrait of the unknown. Sharing the power of expression, the two own female identity and a flair for fashion. With an appreciation for aesthetic – on and off the canvas – the artist draws on elements of haute couture for a modern twist on portraiture. Based in Rotterdam, Netherlands, Buiter creates fashionable art from the shoulders up. An accomplished professional with roots in the fashion and beauty industry, Buiter worked as a makeup artist before making the move to businesswoman/entrepreneur. After years working as director of the cosmetics booking agency, Beautypartner, and collaborating with established fashion houses such as L’Oréal, Chanel and MAC, she chose to pursue the role of full-time artist. Considering her beauty background, it’s easy to assume that Buiter’s artistic style would evolve naturally. However, she admits it was a real struggle. 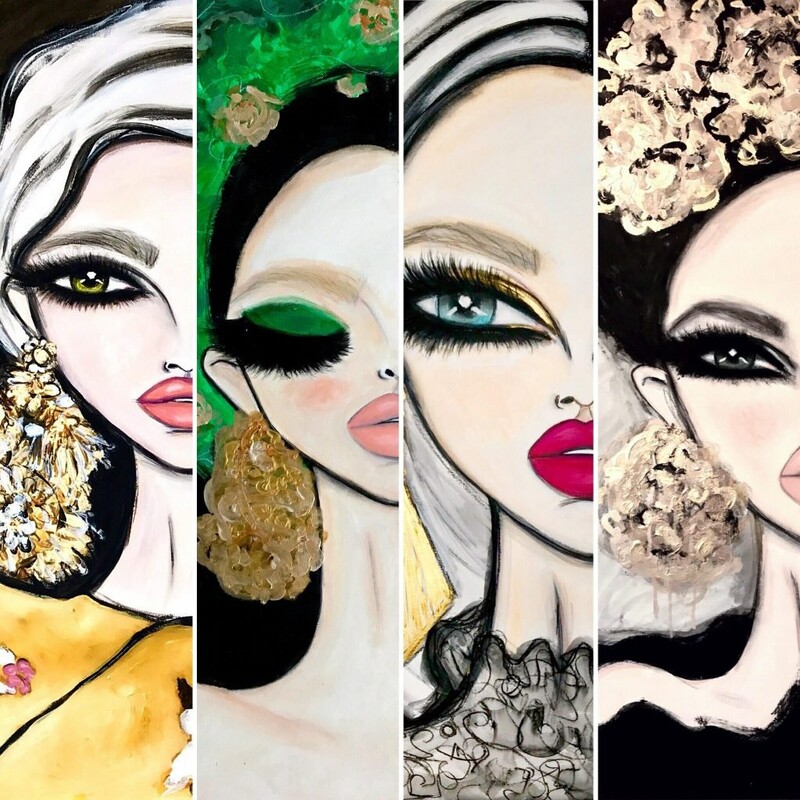 After exploring different muses, methods and materials, the artist established an approach based on her history styling models – painting beautiful, imaginary women with similar features: big eyes, bold lashes and luscious lips. From using the face as a canvas to applying the face as a subject, Buiter defines beauty through decoration. Similar to the layers of her professional success, Buiter works with many different mediums: ink, crayons, markers, watercolors and acrylic paint. When creativity strikes, a painting is sometimes finished in as little as one day. Inspired by looks from the runway, Buiter creates the faces of women who do not exist – yet, are still relatable. According to viewers, certain works have been known to resemble a famous person, family member, friend (or even themselves). “When I started out I would paint the whole body, and I realized that I did not find it as interesting as the face. The eyes pull you in and they draw your attention. Sometimes I will make the shoulders or the back of the women that I draw, but you can always guess what they are wearing. Some of them do not even wear clothes so you will see their shoulders. 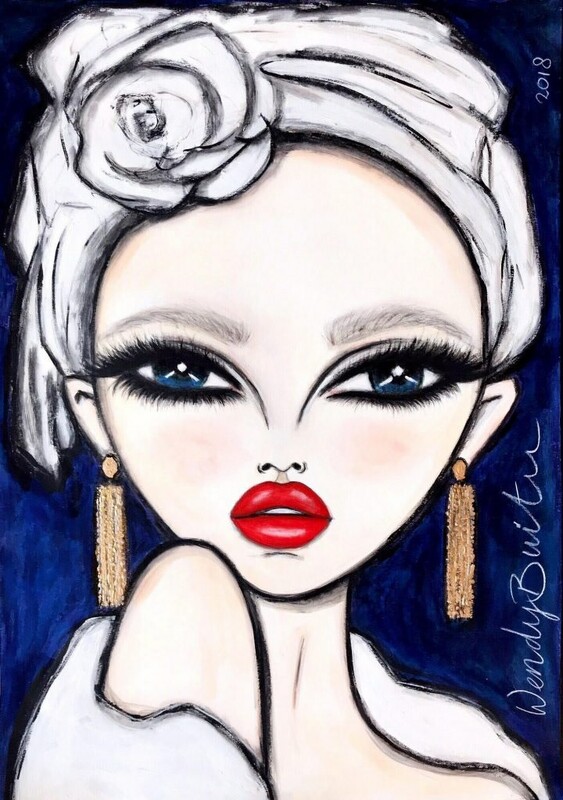 I found out that I just love to draw the head and paint the earings and the accessories and something with the hair,” shares Buiter.